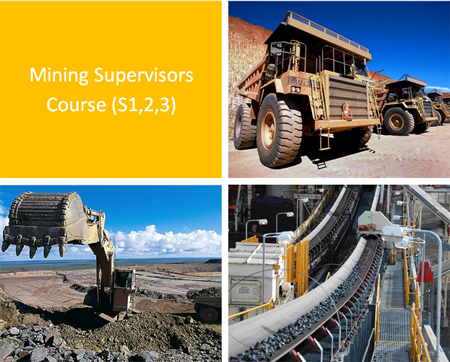 This course develops the knowledge and skills required to safely, effectively and confidently function as a supervisor at a coal mining operation. The Mining Supervisors course is based around the Coal mining industry and is applicable to both surface and underground coal mining operations. On successful completion of this course, trainees will have acquired the skills and knowledge to enable them to undertake the role of and perform the duties and position requirements of a Mine Safety and Health Representative as detailed in the Coal Mining Safety & Health Act 1999. The course specifically targets coal mine workers who wish to progress their career in the mining industry to the position of a leading hand, supervisor, Superintendent, or those who are elected as Site Safety and Health Representatives. Successful completion of the course provides very good career progression opportunities within the mining industry and can also allow for smoother transition into the mining industry for people from non-mining backgrounds.